Not exactly helpful, but likely what you’ll hear from the powers that be. Overwhelming, to say the least. Especially if you’re new to the content game. It’s okay. It’s not the executive’s job to get into the weeds of how content marketing works. And once you know how content marketing works you can set realistic plans and expectations. You won’t play into the vicious cycle of creating a bunch of busy work that strains already overworked teams. Instead, you’ll develop a plan to create high-quality content that’s meaningful to the business. Here’s the first thing you need to understand about content marketing. Content marketing works best when you take a long-term approach. Yes, you can get short-term wins but expect to invest 12 to 18 months to see the significant impact of your efforts. Your efforts work best when you recognize the difference between content and content marketing. It’s a subtle difference but an important distinction because content alone leads to a mentality of high activity with little return. Where content marketing emphasizes quality over quantity and shifts the mindset toward asking how can we do less to get more? But let’s not get ahead of ourselves. 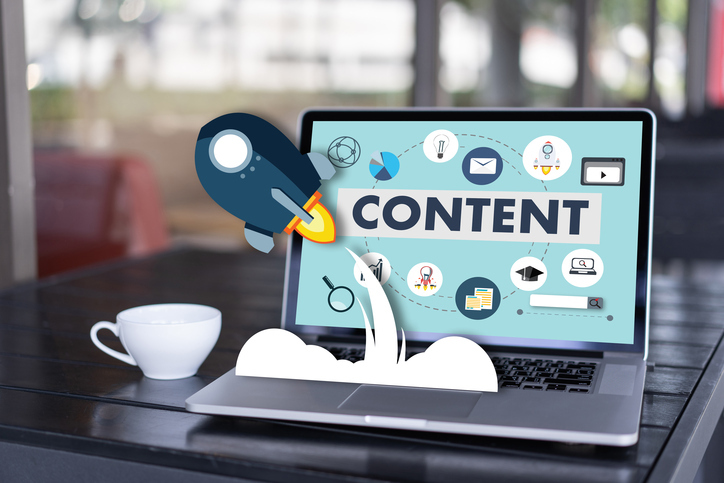 Content marketing uses content in various forms to attract an audience for your business’ products, services, and programs while influencing the behavior of that audience over time. Content marketing is important because the content is what people search for, consume, and share online and offline. It’s also worth mentioning that anyone can get started with content marketing at a relatively low cost. However, without a proper content marketing strategy in place, you can end up engaging in time-consuming activities that yield little results. Let’s start with the overall benefit of content marketing: over the long term, you’re building an asset for your business. Typically, in the form of a blog. As you create and add more purposeful content to the mix, you start a snowball effect that increases in value as you go along. Your authority in your industry grows as you consistently share your expertise in the form of valuable content. Over time it compounds in value to your business. Side Note: Think of content marketing as an iterative process. Create the best possible piece of content you can at a given moment with an eye toward revisiting and improving based on what you learn from producing not only the content but also the feedback you receive. The first benefit of content marketing. You’re able to speak directly with your prospects and customers, and the access you have to that audience provides value. Think about how much money businesses spend on advertising on other sites. Why do they do that? Because the site attracts the audience the business is also trying to reach. How does it change things for your business if you can attract your own audience and speak with them directly? As you start drawing more people to your content marketing platform and moving them toward taking business actions, you begin to save and make your business money. Again, it’s not just a blog, it’s an asset for the business. People do business with those they know, like, and trust. Content marketing allows you to start building those relationships that are important to your business. Since content is what people search for, consume, and share your content marketing efforts allow you to not only make new people aware of your business but also move them toward taking the next steps. What are the main things your audience is struggling with in relation to your products or services? Content marketing allows you to have conversations with the audience so you get a better understanding of what they’re struggling with from their point of view so you can provide resources to help them overcome those challenges. Your product or service solves a specific problem for the people you’re trying to reach. Content marketing gives you the opportunity to explore the benefits your products and services can provide and bring them to life in a way you may not be able to on a landing page, brochure, or sell sheet. Are there questions or things that often come up as reasons for why someone doesn’t move forward with your business? Content marketing allows you to address those objections head on and make a case for why the prospect may want to look at the issue differently. How does your product or service make like better for your customer? Tell stories of existing customers using your product or service to overcome their challenges. Demonstrate ways their lives will improve. When you create high-quality content to address the real needs of an audience, you’ll start attracting more of this audience to your business. The content you create opens up new opportunities with non-competitive companies trying to reach the same audience. Content marketing isn’t just about attracting new customers, it also helps with customer retention and loyalty. Focus on creating resources to provide value to your customers and help them become more successful with your product or service. As conversations develop around the content you’ve created to explore your audience’s pain points, you may discover new opportunities for products or services that would serve them. Content marketing can give you a sense if there’s interest in something before creating it. As you create content around your area of expertise, you start to build a reputation with search engines. You end up saving your business money in traffic costs by increasing the visits that come to your site organically. Above are few of the benefits of content marketing, a content marketer must look for opportunities in the areas above. Overall, a content marketer develops a deep understanding of the audience or audiences they are trying to reach to create content that attracts more of the audience to their business. The better you know them, the more your content resonates with the audience and the more impactful it becomes to your business. What comes under content marketing? That’s an interesting question, isn’t it? Today, I’d argue that content marketing is just…marketing. Or the way marketing is done today. At a high level, content marketing is an extension of the story your business is trying to tell. This story needs to flow through every group that interacts with your customer. Saying everything comes under content marketing may sound far-fetched, but if you recognize how a business uses content at every stage of a customer’s journey, it’s actually not far off. It’s the goals and uses for the content that change based on where the customer and the business are engaging. Here’s an example of how content marketing works. Someone searches for an answer to a particular problem. The person finds content that provides a solution. Depending on the intent behind the search this could lead to someone taking the next step. That next step also depends on the nature of the business. The next step could mean making a purchase, starting a trial, requesting a demo, filling out a form, or subscribing to receive more content to name a few. Content can then be used to move a person to the next step after that. Let’s says someone becomes a customer, content can come in to show the new customer what they need to know and how to achieve success. Once the basics are given, content can then get more advanced to explain other things the customer can do with the product or service. You may also have other products or services that content can educate your customer on. Content marketing seems like a lot to take in. That’s right. It’s easy to get started with content marketing. The hard part is getting everyone on the same page and showing how the story comes together throughout the business. The complexity grows with the size of your business as well. The more you understand about your business and the more you practice the craft of content marketing the better positioned you’ll be to have the most impact. You often have to apply the same tactics and thinking with the internal business as you’re trying to use externally. But that’s for another post. Think long-term in your approach to content marketing, but look for quick wins along the way. Content marketing isn’t about creating more stuff, it’s about creating stuff with a purpose. Content marketing creates many benefits by allowing you to build an audience and speak with them directly. A content marketer must know the audience like no one else to have a meaningful impact. Understand the role of content marketing throughout your business to serve the audience and the business best. What do you think? Was this post helpful to you? Let me know in the comments.